Please fill out the form below and our sales staff will get back to you as soon as possible. Customer satisfaction plays a vital role in managing a business in this competitive world. It helps you reach more people through creating an interactive relationship thus, leading your business into success. Taking into action, customer’s opinion and suggestion gives a perception that you are taking their feedback in consideration and produce an expression that you are passionately committed towards serving them. 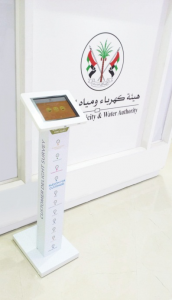 Given the importance of that feedback in reaching or exceeding the customer satisfaction, the electricity department Sharjah (كهرباء الشارقة) has deployed the Customer Satisfaction System installed in customized kiosks placed in its 13 branches, manufactured by RSI Geeks to effectively monitor and check the happiness index of customers – who availed their service. This is an initiative done by (كهرباء الشارقة) to join the continuous effort of the UAE Government in promoting happiness to achieve a happier and peaceful society. The Customer Feedback System Dubai let client handle the customer feedback with lesser ease because it can widely cover different parameters that could affect or influence their judgment such as experience, quality of products and services, time-lines, environment, and other relative aspects in an instant. Hence, it helps the agency to know who their customers are, understand what their customers need and give what their customers want. This is in line with the agency’s customer experience strategy – to give the desire of its consumers, deliver value for the customer and develop capable employees to please customers repeatedly (from their vision of 2020). Using technology to improve customer relationship is timely and advanced at the same time, easy and more accurate. This innovative system makes acquiring knowledge and ideas from real SEWA customers highly possible. Once all the necessary information is gathered from the customers, there would be immediate discussions and faster response. It is a significant action to win the customers. And this customer satisfaction feedback will create customer loyalty and retention because they feel that they are important and that they are involved. The department can constantly improve their water and electricity services since they have the customer feedback system that could identify other strength and weaknesses of the agency as observed by the consumers. Since the customer feedback system is installed in a customized kiosk, RSI Geeks made sure that it is accessible and customer friendly. Customers can spend few minutes in answering some questions while waiting or right after the interaction. This would let them input accurate feedback as the feeling of experience is still fresh on their memory. It is also made handy as the system has a mobile app version available for both IOS and Android phone users. The electricity department (كهرباء الشارقة) is consistent towards achieving one of their goals – to establish a distinct position in the mind of the consumer in such a way that effectively communicates their core values, which has led them in engaging themselves to the Customer Feedback System. This effort would obviously bring the desired results later on. “A satisfied customer is the best business strategy of all” as said by Michael LeBoeuf. So, regardless on the nature of the business, whether big or small, listening to the customers should always be considered. What is a Kiosk Machine? Kiosk is a self service device that is most of the time installed at public places for some specific or general purposes such as capturing customer feedback or issuing a loyalty card in a store or helping visitors of a shopping mall to find a particular store. What other names can be used for Kiosk? Kiosk Machines are also known as Self Service Kiosk, Interactive Kiosk, Touch Screen Kiosk, iPad Kiosk, Tablet Kiosk, Samsung Tablet Kiosk and so on. Kiosk machines are built with metal, cast iron, stainless steel, fire rated medium density boards, acrylic or plastic. Cost is the major factor of choosing the material of the kiosk. How are Kiosk Machines designed? It starts with requirement gathering, then sketch making. The sketch is transformed into drawing and preferably 3d image. What kind of devices are installed in Kiosk Machines? Kiosk machines can be stand alone screens to have video input coming through HDMI cables or media players or interactive kiosks can be built-in or separate computers fixed in the kiosk. What is the difference in a standalone kiosk and interactive kiosk? In a standalone kiosk the video source of the screen is either transmitted through HDMI cable from a central room or an individual media player is attached with the screen. Media player is then connected to the network over Wi-Fi or cabled network that is Ethernet. Should I go for an interactive kiosk or a screen based kiosk? It totally depends on the requirement. If you want visitors of a shopping mall to be routed to a store on an interactive map then you need a computer and a touch screen where the user can type the store name or tap on the map to navigate. A customer feedback system and visitor survey will also require an interactive kiosk. If you need to display static or dynamic ads – a standalone screen with a media player or any other video source is what you need. What should be the screen size of the interactive kiosk? The size of the screen of interactive kiosk depends on the type of application is to be used for user interaction. Issuing a token in the bank for waiting customers will require a small screen. Similarly a customer feedback system requires a small screen to take user input in the form or emoticons. While routing the customer on the map requires a large screen. What is a kiosk app? A kiosk is either a standalone screen or an interactive kiosk. In the aforementioned the media player has a web browser interface where the required images, videos, presentations and other form of data can be played. An interactive kiosk requires an app to be installed where the user can interact with the machine using human interface mechanism. Such as an application in garments store can let users try different clothes with a tap of screen using different clothes or a navigation app in the store can route customer to their directions. The historic Qasimi Library, then founded in 1925, is now known as Sharjah Library, and operates under the Department of Culture & Information, Emirate of Sharjah. The library is located at the cultural square Sharjah alongside the famous Airport Road also known as E88. Sharjah Library provides certain services to the visitors of the library where interaction with the staff and automated systems is a necessity. To continuously improve and strive to provide in-time and utmost services, Sharjah Library acquired Survey System and Visitor Feedback System to receive feedback of the visitors. Sharjah Library also has a facility for schools where school children visit the library to get acquainted with the topics which are beyond standard school studies. This helps students to get familiar with the history, current affairs and the library ethics. Visitor Feedback System provided by the team of RSI Geeks is deployed on the two kiosks which are used for elders and children. The visitor of the library can participate in the feedback system to provide the feedback about the services provided while leaving the library. A graphical, Emoji, Emoticon and Smiley based feedback system is installed on both the kiosk which are designed and built in mild steel and spray paint to get a decent finish to be kept and presented at the entrance of the library. A small version of the kiosk is specially customized and designed for the children along with a base where children can stand and use catchy graphics to leave their feedback. This small version of the kiosk also has provided a mean for young children to be attracted towards a touch screen and interact with it. The administration and the management of the library has been provided an administration panel of the Visitor Feedback System where they can create different feedback questions time to time. They are also provided with a reporting system where the visitor feedback can be analyzed and enhancements or improvements can be planned and executed. Visitor Feedback System deployed over Touch Screen Kiosk is a standalone interactive machine that can help any organization to get instant customer or visitor feedback that can be analyzed to for improvements in the customer experience or business process. NYU Abu Dhabi is a University focusing on research of arts and science colleges in the emirate of Abu Dhabi. The students all around the world approach the University for its standard of Education and facilities provided for the education seekers. In order to provide student friendly services within the campus NYU Abu Dhabi decided to install Kiosk machines within different departments of the University. Team at RSI Geeks worked with the team at Abu Dhabi University to come up with two different customized kiosk machines that will have iPad to interact with students. First design of the interactive Kiosk is a floor standing kiosk with a huge area for artwork to attract students. The Kiosk has all around graphics and NYU artwork to give a unique look to the kiosk. iPad is installed in kiosk in a way that it will have continuous connection to the power socket with concealed cables and at the same time iPad can be removed from the kiosk for servicing or app installation or update purposes. Survey System Kiosk:Â The other design of the kiosk was also a floor standing kiosk with our standard kiosk model. The kiosk has the ability to fit in any screen size or any brand of tablet. Be it iPad or Samsung or Lenovo tablet, all the types of tablets can be installed in 9002 model of our kiosk. It is created in mild steel or fire rates MDF as and how it is required and adjusted in the environment. The kiosk had ipad installed to interact with the students in the form of Survey System. Team at RSI Geeks is committed to provide best of the class after sales support and service to customers to ensure that each and every installation of Kiosk , Computer Kiosks, iPad Kiosk or tablet kiosk are operational and serving the requirements of the customers 24×7. To enhance the security of the facility, Falcon Breeding Farm approached RSI Concepts to install CCTV surveillance systems. Falcon Breeding Farm is a world class falcon breeding and training facility. It is under the auspices and patronage of the Crown Prince of Dubai, His Highness Sheikh Hamdan Bin Mohammed Bin Rashid Al Maktoum. Falcon Breeding Farm is a premier falcon training and breeding facility where very precious breeds of falcons from all over the globe are trained, bred, and looked after with care and commitment. RSI Concepts is one of the leading providers of CCTV surveillance systems in Dubai. RSI CCTV security surveillance system has been acquired by many multinational clients.Â These CCTV surveillance systems have always been customized to suit and meet the security requirements of the clients. For the installation of the CCTV cameras and surveillance systems for Falcon Breeding Farm, the RSI Concepts team work together with the team from the Falcon Breeding Farm. Both the teams assiduously chalked down the various surveillance needs of the Falcon Breeding Farm. After this blueprint was drawn, RSI CCTV surveillance systems were designed and deployed in the precincts of Falcon Breeding Farm. 109 CCTV cameras were deployed in Falcon Breeding Farm in order to monitor the falcon development and training activities. The cameras were installed both within and outside the buildings. These CCTV cameras are intrinsically designed for both indoor and outdoor surveillance. They are weather proof, function optimally both during day and night, and also provide a 360 degree view.Â Additionally these CCTV cameras are built on the latest technology and hence provide foolproof security. The CCTV surveillance systems installed at the Falcon Breeding Farm now provide a 24 x 7 surveillance, monitoring, and tracking of every area of the training facility. Managers can now keep track of every movement happening within the facility and also record the footfalls in and out of the facility. Staff work and functioning can also be traced and recorded effortlessly. The CCTV security systems which have been put in place in the Falcon Breeding Farm allow access to trainers through smart phones. This means that remote monitoring of training of the falcons by the staff is also feasible. Such a facility has provided the managers with the mobility which allows for increased all round efficiency and productivity. The Falcon Breeding Farm is now completely secured with RSI CCTV security systems. This not only helps the management to record and track every movement, but also provides a mechanism to ensure that the staff and operations are at the productive best. Khorfakkan, the creek of two jaws and with only natural deep seaport in the region, is a second largest town located at the east coast of United Arab Emirates. Khorfakkan is a part of the state of Sharjah, dominated by its super busy container port. Khofakkan is also a famous weekend destination of the country due to the beautiful mountainous landscape throughout the city and a beautiful curved Cornish. In February 2005, the emirate of Sharjah established nine municipal councils among which one was the Khofakkan. The Municipal Councils are considered as monitoring bodies to propose laws, regulations, supervision and other platforms that reflect the concerns and problems of residents and to provide solution by all means. In order to provide in-time and quick services to the residents of Khorfakkan the Municipal Council has worked on state of the art technology in the recent years. This Gitex 2017 Khorfakkan Municipal Council has launched e-services portal, with a beautiful web design along with face recognizing and voice responding kiosk machine to facilitate the residents. KM (Khorfakkam Municipality) has also launched a mobile application on two platforms IOS and Android for the residents to avail the services quickly. RSI Concepts has been the technology partner of KM to develop custom web application for the kiosk machine which has the capability to interact with residents over speech and face recognition. Ajman X 2018 is a platform for Government Entities to showcase their achievements and highlight their goals and challenges. RSI Concepts is exhibiting at Ajman X 2018 to showcase some of our products such as Queueing System, HR Self Service Kiosk, Artificial Intelligence Robots, Feedback System and Survey System to help local Government bodies to understand, utilize and procure latest technologies to provide better customer experience and hasten the business process. Visit our booth in Ajman X on 7th and 8th May 2018. Oman is the second largest country after Saudi Arabia on Arabian Peninsula with the geographical area of 309,500sqm with the population of 4.5 million approximately. Having an almost 2000 miles coastline across the country it has huge importance in the region. Postal Services in Oman are taken care by Oman Post, fully administered by Oman Government since 1966. Since then, Oman post has never looked back in the progress of the postal services to serve the residents of the country. Every now and then the department has worked to adapt new resources, mechanisms and technologies to progress in the field of postal services. RSI Concepts and Oman Post have signed a Queuing System project for five of the branches where the customer foot fall was a concern. Token machine System at branches will save resources and time of Oman Post administration, eventually serving the customer in short possible period of time along with quality service by using reporting and in-depth analyzing features of the token system. The branches will be equipped with ticket dispensers, waiting LED screens, Sound System and required software applications integrated with the business process to facilitate administration, management and customer experience. Acquiring of Queue system is a sign that Oman Post is constantly looking to improve their services for the residents of Oman. Mirdif City Center in Dubai – Carrefour Hypermarket acquires Queue System from RSI Concepts Sharjah. 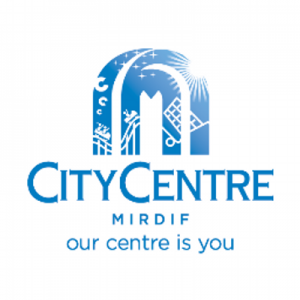 Mirdif City Centre is a shopping mall located on Sheikh Mohammed bin Zayed road in Dubai. The mall is a popular destination for the shopping goers as it has more than 400 stores with a number of activities for every age including restaurants, cafes, a cinema and two huge food courts. The mall also has a Carrefour Hypermarket to serve shoppers. 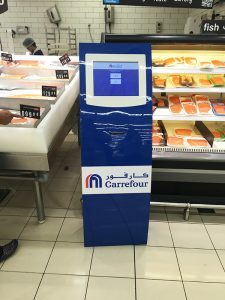 With all other hypermarket facilities, The Carrefour hypermarket has a fishery section to help shoppers find the sea food they need. Due to the high quality and low prices of the products at fishery section it has a huge demand and the section is crowded in peak hours. The management of the hypermarket has acquired RSI Queue System (a product of RSI Concepts to manage queues and customer waiting) to help customers serve more efficiently. With an effortlessly functioning Queuing System, Carrefour hypermarket has better throughput and time saving of customers. Queue System: Union Cooperative Dubai (UNION COOP) is a consumer cooperative society in Dubai whose mandate is to establish and manage hypermarkets in Dubai and to promote the growth of its members. Belonging to the field of business and commerce, UNION COOP, has a lot of transactions with its hordes of clients every day. Servicing clients and ensuring their happiness became a very pressing need for UNION COOP. In order to improve their efficiency, UNION COOP approached RSI Concepts to design a queue management system. RSI queue systems are famous in Dubai and other regions of UAE for helping in swift customer service and enhanced productivity. These queue management systems have been designed and installed for a very many enterprises and government organizations across various business verticals. RSI queuing systems are built on cutting edge technology components which make it solid as well as agile. The queue system also enables a quick customer flow management system and is very user friendly. The teams from UNION COOP and RSI Concepts first drew out a plan to design an active queue management system which would help in better client servicing. All the requisite parameters were jotted down and the various influencing factors were mapped. After this brainstorming, the team from RSI concepts proceeded to customize and create a queue system for UNION COOP. This queue management system had a very smart queue manager in place and was designed to actively manage queues in the most user friendly manner possible. After the testing phase, the queue system was installed. The staffs of UNION COOP were trained to use it. Some of the features of the queue management system designed for UNION COOP included an automated ticketing system, a robust customer flow management algorithm and a very active queue system which reduced customer waiting time drastically. With a smoothly functioning RSI QUEUE system in place, UNION COOP has had a leap in their productivity and efficiency!